The Microbiology Society Annual Conference in Edinburgh was a valuable opportunity to present our research to the international microbiology community and to engage with a wide range of experts. I especially valued the contribution of clinicians, who pictured the actual situation in hospitals and described major barriers, risks and needs for treatment of persistent infections. Produce extremely resistant and stable spores, which are insensitive to current antibiotic therapies and disinfection practices. 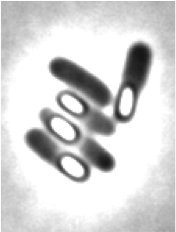 The group of bacterial spore formers includes several pathogens causing deadly infections (Bacillus anthracis, Clostridium difficile) or food poisoning (Bacillus cereus, Clostridium botulinum, Clostridium perfringens). Good understanding of bacterial physiology during sporulation is therefore crucial for efficient prevention and treatment of such infections. The sporulation process leads bacterial cells through a specific developmental programme to form highly resistant and dormant cells, called spores. It is a complex cellular differentiation process involving the accummulation of large amounts of cations in sporangia. The most abundant cation in mature spores is calcium, which is essential for spore viability and resistance. However, the dynamics and the role of calcium during the sporulation process are poorly understood. In our research we examined calcium dynamics and the effect of potential alterations on the sporulation process in the model organism for sporulation studies, Bacillus subtilis. We also characterised profiles of potassium, pH and membrane potential in sporangia. This study will therefore contribute to understanding electrophysiological dynamics in spore-forming cells, with potential applications in the development of novel antimicrobials and identification of new drug targets.